I’ve been in love with designs from Charles & Ray Eames since I learned about them in design school and to celebrate my graduation my husband gave me my first piece of their iconic furniture, the LCW. Since design school, each time I get a chance to “need” a new piece of furniture I always pick out mid-century modern classics. My history of furniture teacher said that furniture is the best investment you can make, so that could be my excuse or it’s just that I have an obsession with that era and with chairs in particular. As Hudson’s second birthday was approaching on February 4th we were at a loss about what to get him. We felt that we over did it at Christmas and he didn’t need nor did we have any room in the toy box for more toys…..but I always have room for a new piece of furniture :) So we decided that it was now or never, he was the perfect age to play with an Eames Elephant and if we didn’t get it now then it would not really be a toy for him later. I just adore this little elephant and just as the rest of my mid-century lovelies Im really into learning about the history of its design. Unfortunately doing just web research I can’t find much info on the origin of the 1945 design. I had hoped to find a drawing or a picture of the Eameses with one of the original two prototypes. Im sure that in a real book somewhere is all the info I want so ill be on the look out for that, until then I have a bit of history to share and I also have found some great new pictures of how people are having fun with the reproductions of this precious pachyderm. 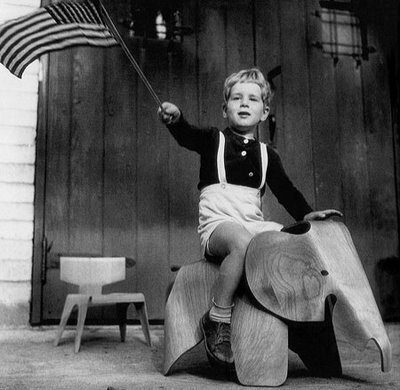 The plywood elephant was among a menagerie of plywood animals that the Eames designed around 1945, the same time they were designing and experimenting with splints and chairs. 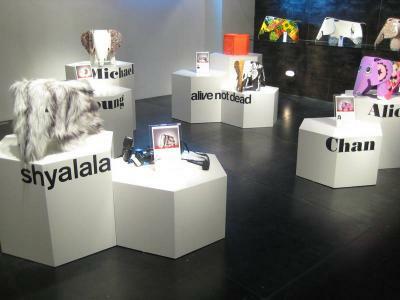 But none of the creatures – elephant, frog, seal, bear and horse – ever moved beyond the concept stage. 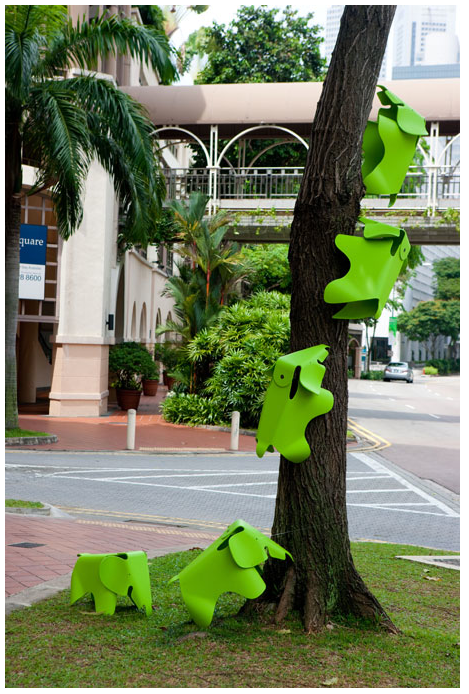 Their fabrication was too challenging to be mass-produced with compound curves and tight angles. 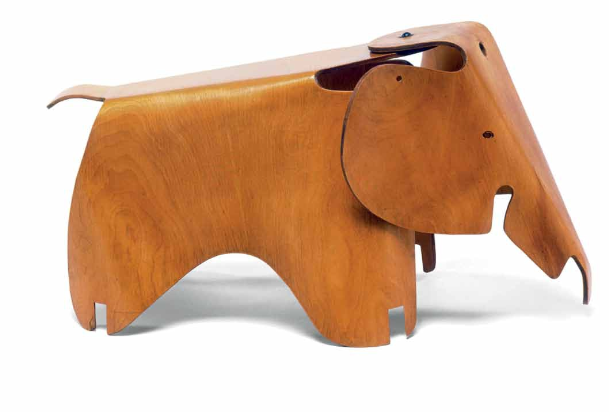 Two elephant prototypes were made and displayed at the Museum of Modern Art from 1945-46 and the only surviving elephant is safe in the hands of the Eames family. 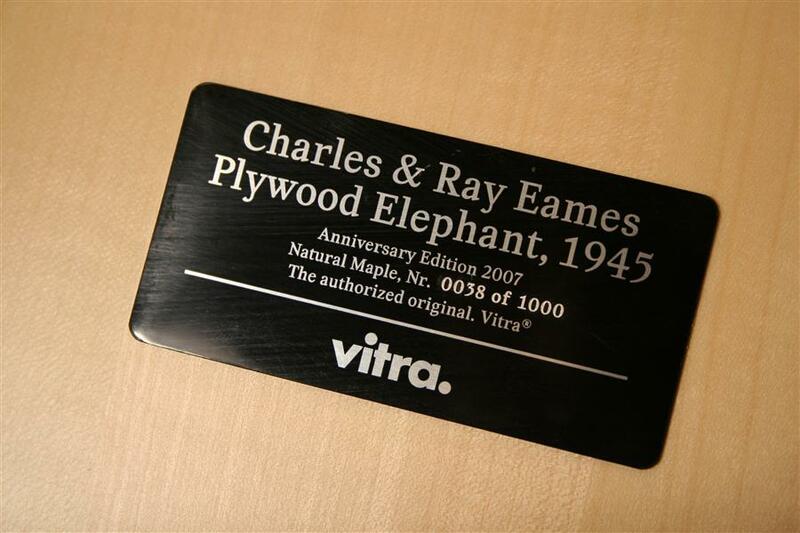 To celebrate the 100th birthday of Charles Eames in 2007, Vitra decided to master the art of producing the plywood elephant and released limited edition plywood elephants, 1000 each in natural and red stained maple. 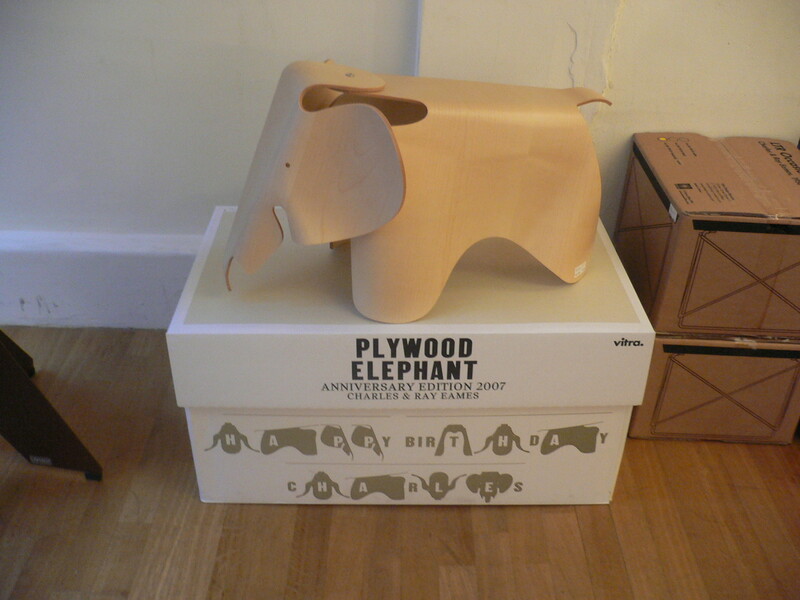 Hive modern still has a limited edition plywood elephant for sale see it HERE! The response was overwhelmingly received and all 2000 copies sold out immediately at $1900 each! 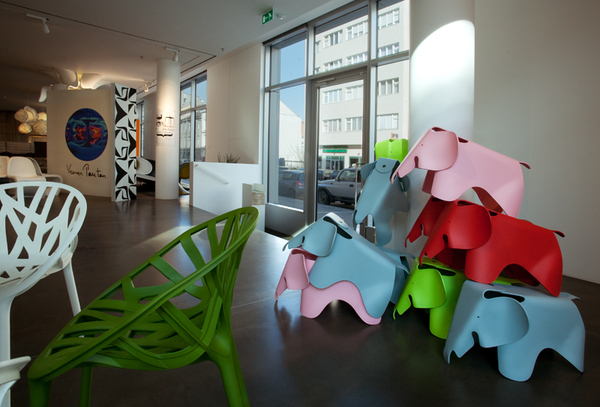 Since the cost and limited production made for an instant collectors item, Vitra decided to develop a second series of elephants made from plastic in 2009. 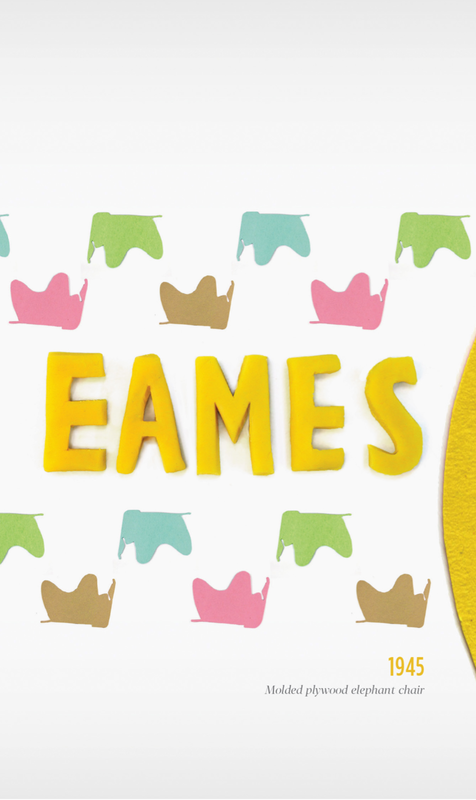 A nod to the fact that the Eameses were the first to use plastic in furniture in the 1950’s and also making this new series affordable to buy for the intended user – a child! 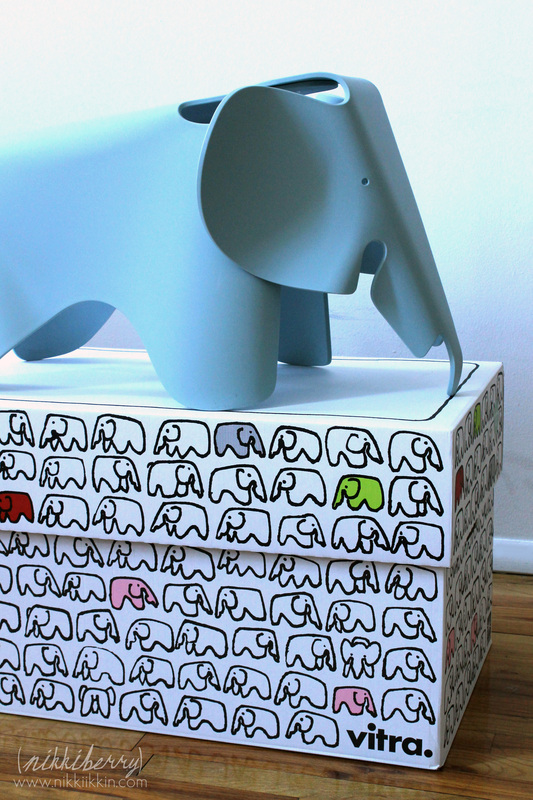 Current pricing of the elephant is $290 and comes in red, ice-gray, white, lime and pink. You can find them stocked and ready to ship online in stores like DWR, Hive Modern, All Modern, Modern Seed and Design Public. This brochure for the new elephants is FANTASTIC, besides being made by a graphic design student, it has the flat pattern of the two components for constructing mini paper elephants. So its marketed for kids but I’m thinking of all the other things I could make like….a fondant cake topper, swoon! 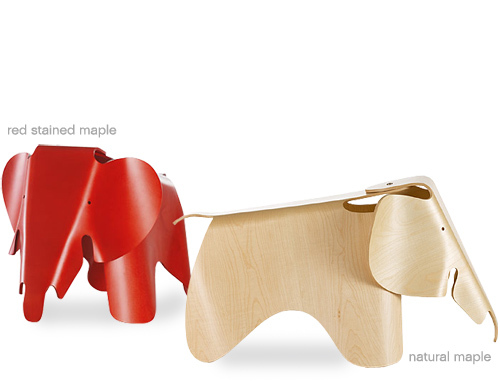 If you are a furniture lover or design professional without a child, don’t let that deter you from adding this beautiful sculptural piece to your home, it looks like a “stool” to the adult crowd or consider the Vitra miniature in either Red or Natural plywood for $185 as a book shelf decoration. Hudson loves to trumpet along with the elephants and move to the african drum beat, its a great little film! Im excited to share that this film was brought to my attention by a tweet from Eames Demetrios himself! 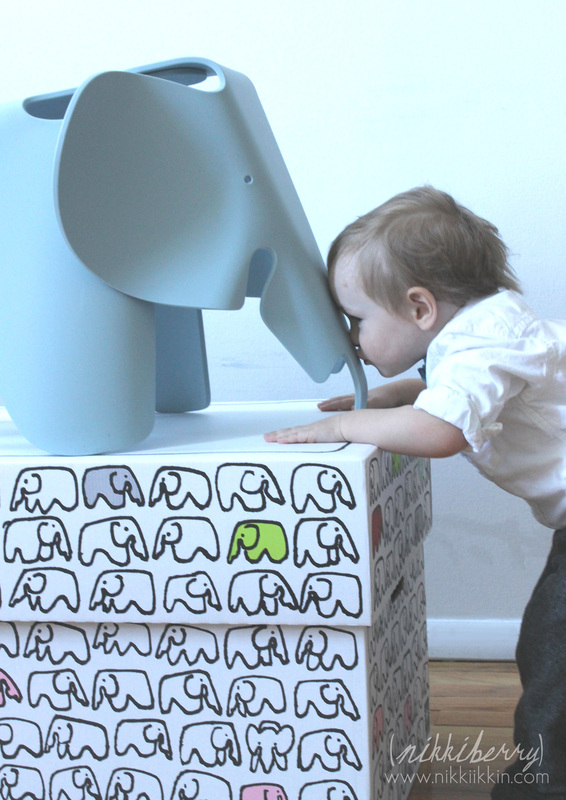 Its only been a few years since the release of the new elephant and I’ve searched around to see how its being used and displayed. 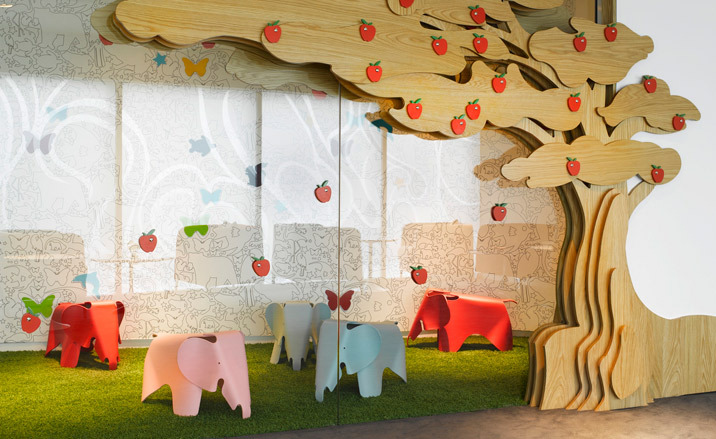 Check out this playroom at the new London Virgin Atlantic Clubhouse!! 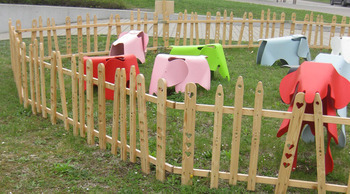 I found several Flickr pictures that show this outdoor “elephant pin” from the Basel Vitra Design Museum. They must be rearranged daily, each picture had them doing different things. It makes the little guys seem to really have a playful personality seeing them “running around” this pin. This little elephant is so much fun to photograph, I can’t wait until a warm spring day when we can take him outside and take more pictures! Hudson already loves playing with him, since the back is sloped he likes to run his cars off of it like a slide and once I caught him trying to climb through its backside, that would have been a good picture! 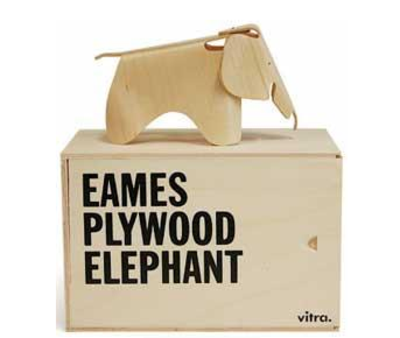 This is one of the best post about Eames plywood elephant I’ve had the chance to read so far. Great job ! Thanks Alex, Im sort of a design history nerd :) I wish that everyone appreciated and understood the importance of the great icons in design history. Love your illustration and thanks for sharing it, I’m sure my readers will enjoy it too. 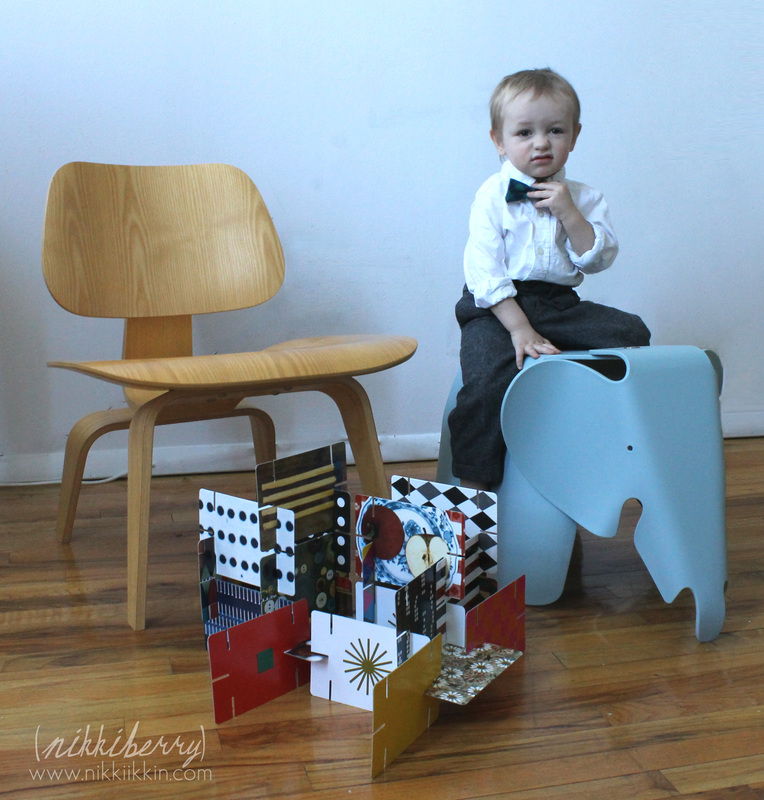 I bought the Eames elephant and your blog inspired me to write about my purchased and unboxing. But it is not as informative and educational as yours. I hope you can drop by my blog and have a read. such an informative post about the elephants!! love it!! thanks i wish i could have found more, i love the secrets in design history!